I had always liked the Garden Gnome Hordes of the Things army available from Peter Pig. Unfortunately, before getting around to getting a set of figures, number two son, Steven, beat me to it. Still, 12 months of concentrated haggling saw the army slide across to my possession. Basically, the figures in the pack from Peter Pig cost under a tenner (UK prices) and provide sufficient figures for 24 AP worth of army. There is enough of a Charlie Dimmock Water Feature for a Stronghold as well! None of my current armies have a magician either so it was a good addition to the collection – even if this was only in WWW ((www – not the World Wide Web as you may think, but the “wee willie winkie” scale)) scale. I will admit to having preferred to do this in GOS ((God’s Own Scale – or 25/28mm figures)). An extensive search of “garden gnomes” on the Internet has resulted in some wonderful sites (er, and some bizarre and some strange). Gnomes really seem to bring out the weird in people. One thing I have noted – an awful lot of gnomes have red hats. Gnomes also look fairly flat in their painting. They have flesh coloured flesh and almost univerally white beards (one had a grey beard and I am starting to think that may have been a german thing). The colours that gnomes are painted in are generally very bright, although they do fade when they have been out in the weather for a while. When I asked around about gnomes, it was mentioned to me pretty much by most people I spoke to that gnomes were red hatted chaps with blue coats. However, the more I looked at gnomes on the Internet, the more I noticed that there was a lot of variation in the colours. So, in my Hordes Army, I tried to include as many different gnome colour schemes that I could find. Check the Photo Gallery of Thomo’s Hole for pictures of the gnomes (they will be under 15mm Hordes of the Things Armies). Gnomes also bring out the wierd in people. The best example of this oddness is the news reports, picked up from Ananova and CNN over the past few years of the Front de Liberation des Nains de Jardin (FLNJ) ((The official FLNJ website is at http://membres.lycos.fr/flnjfrance/)) – or the front for the liberation of garden gnomes. For example, Ananova (a fascinating news service in that the reading of their news immediately outs you in a technicalm breach of the copyright agreement you agree with Ananova by reading the news – Lawyers should not be allowed near the Internet as the technology is a mystry to them but they will attempt to fake it and convince peoplem they know what they are talking about) ran a series of articles on 12 July 2001, 26 July 2001 and 7 August 2001. These stories reported the liberation of 105 Garden Gnomes in France. A further 98 Gnomes were released on the 26th of July. 15 gnomes were liberated in Alsace in the August Report. PARIS — The dormant Garden Gnome Liberation Front has sprung back to life, stealing about 20 gnomes during a nighttime raid on a Paris exhibition. “We demand … that garden gnomes are no longer ridiculed and that they be released into their natural habitat,” the Front’s Paris wing said in a statement following its weekend strike. These Gnome liberations have been occurring since 1997. In 1998, 11 Garden Gnomes committed mass suicide, hanging themselves under a bridge at Briey in France, leaving a note explaining they were “leaving this cruel world … to join the temple of oppressed gnomes”. .
On 3 August 1999, ABC Australia (http://www.abc.net.au/news/1999/08/item19990803075036_1.htm) reported that the Garden gnome liberators had struck again after a total of 143 garden gnomes had been discovered lined up in front of the Town Hall in the city of Sarrebourg. 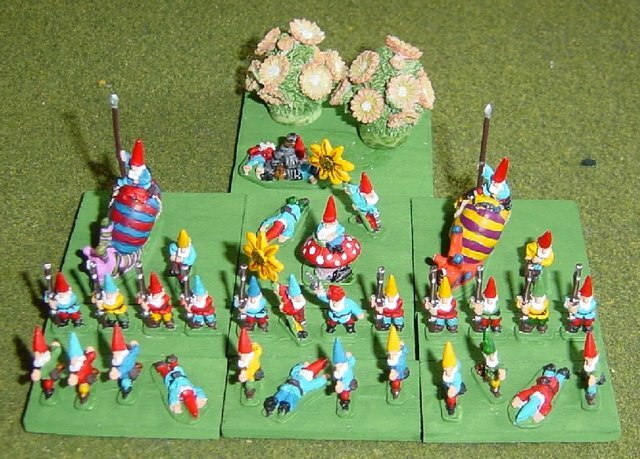 These then are Thomo’s militant garden gnomes, from Peter Pig Figures (see Web Links for an address for Peter Pig). Oh, and the ridiculous Ananova Copyright? When you check the copyright statement after reading some of Ananova’s news, it says, “The Information cannot be reproduced, modified, transferred, distributed, republished, downloaded, posted, sold, re-sold, exploited or transmitted in any form or by any other means including (but not limited to) electronic, mechanical, photocopying or recording without the prior written permission of Ananova.” Of course, reading the article causes it to be downloaded to your PC. Obviously Ananova should have used a gnome to write their legal statements – the gnomes would have gotten it correct! Shirt – Red, Green (mid or grass green), yellow, blue (mid, dark and light). These colours are split in fairly even proportions. Trousers – Mostly blues, red or greens. Occasional black, yellow or brown. Boots and Belts – black or brown. What about a such collection?